These have changed with the needs of the people over the centuries. In the past thirty years there has been some effort to register and regulate these tracks. The definitive map of footpaths on the Ham seems to have been copied from the O.S. Map of 1884 and bears only a passing resemblance to reality. Taking this map as a source there are only five straight paths on the Ham in the form of two triangles with a common base, that being a straight track between the mills. From each end of this base two paths run to a point above and below the weir on the Severn. No indication is given of a perimeter path, though this is more often used than any other. Nor is there any sign of the path from the Abbey Mill to the point, little used in 1987 but in daily use well into the 20th century by the workers at the brickyard. Officially recognised or not, no one cared much about the paths until the expansion of the rail works threatened to engulf parts of them. Then it was realised that something would have to be done to preserve an appearance of legality. The path linking the mills - TE14 - was extinguished, to be replaced by a new one which followed the back of Mill Avon, which had been in use for over 50 years but which, in the eyes of officialdom, didn't exist. One footpath from Key Bridge to the weir was diverted from the point where it crossed the new boundary of the mill works to meet with the "new" path along Avon bank at a new footbridge from the foot of Smith’s Lane. The footway from Key Bridge along the quay to the Ham (see map in appendix) was, as they say in politics, "unilaterally closed". Both of these, the diverted and the extinguished, were extensions off the highway. The fate of this road would have been unrecorded but for the protests of some members of the public and the fact that some means of getting vehicles on to the Ham had to be retained. Its origin is deep in history. Until 1827 there was no bridge over the Severn between Gloucester and Upton-on-Severn. Crossings in between were by ford or ferry. The ferry at Upper Lode, or Over-Lode was recorded in 1248 under the name of Wulfmeer's Lode, which gives some idea of its age and that of the roads leading to it. These were two in number, each one through the site of a mill. 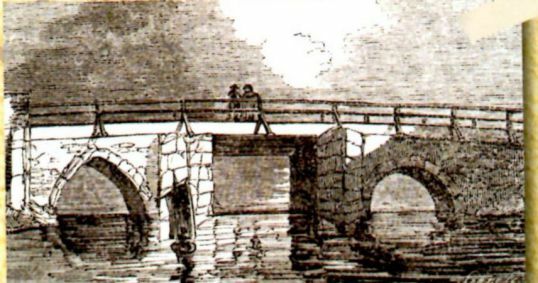 That through Abbey Mill was reduced to foot traffic in the 18th century but the one across Key Bridge continued in use even after the opening of the "Ha'penny Pay Bridge", in 1827. The existence of a pub, there from the time of Elizabeth I. may have had something to do with this. Traffic was heavy enough to support a new toll bridge, authorised in 1808 and built in 1822. This replaced a very decayed stone bridge which was old in the in the 15th century. It may be of interest to note that prior to the Avon Navigation Act in the 17th century access to the quay was possible from King John's Bridge for all types of traffic. The new Key Bridge was a toll bridge and the Trustees of it were granted wide powers and responsibilities. They were required to maintain the whole of Quay Lane which extended to a point 100 yards on the quay side of the bridge, at which point they were authorised to erect a barrier. In time of need they could operate a ferry across the Avon or build a new bridge. And, of course, they could levy and mortgage the tolls (and, by some legal quirk, they owned all the manure in the street). The Borough Council exercised the right to this road in the 1960s when they used the osier beds at the weir as a rubbish tip. The old route of the road is best seen by looking at the map in the appendix. In 1935 this was altered and three buildings on the quay demolished in order to build an extension to the warehouse on the south side of the road. (see Quarter Sessions Records, 1935), In 1986 the whole of this new length was built over and in 1987 an application was made to the courts for its closure. The only firm statement from the Town Council on this matter was to refer it to the Borough Council and to say that the town "reserved to themselves the right to run a bus service through the mill if they so desired". However, as far as the general public goes, the road beyond Key Bridge is no longer public.